Presence Management | Telco Ltd.
(1) Door Phone. Anyone visiting your building that does not normally have access (such as the FedEx driver) would press a button on the EPM reader. 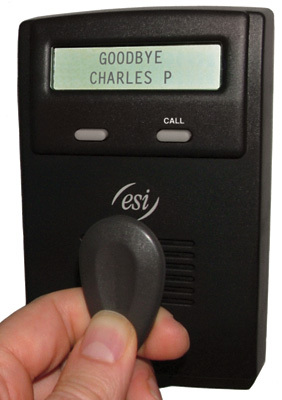 One or more phones in the office that you designate would ring, and whoever answers can carry on a conversation with the outside person, thanks to a built-in speaker on the EPM reader. They could then press a button on their phone to unlock the door. (2) Security access. Each employee or other persons you wish to give access to the building would be given a unique security card or keychain fob with a unique serial number. Thanks to RFID (Radio Frequency IDentification) technology, the card or fob can be passed in front of the reader. As long as it’s within a couple of inches of the reader, it will be read (kind of like Mobil’s SpeedPass, which also uses RFID technology). If that person is authorized to enter, the door will unlock. What’s great is that you can put these readers at any door equipped with the appropriate type of lock, either external building doors or sensitive internal areas, and then specify what areas each person has access to. You can also specify access to groups of people based on time of day and day of week. If a security card or fob is lost or stolen, that card or fob can immediately be deactivated by an administrator. No locks need to be changed out, and the facility stays secure. (3) Time Clock. An EPM reader can also be used as a replacement for a time clock and punch cards. The reader would be mounted in any convenient place, and when the security card or fob is swiped, the system would keep track of whether the person is clocking in our out, along with the time, but it would not be associated with unlocking a door. These in/out records can be downloaded from the system at any desired interval by an administrator and used for employee timekeeping. This information can be tweaked, if necessary, and even imported into certain payroll applications (such as Quickbooks or ADP). Because the EPM readers are integrated with the phone system, some neat things can be done. When a person “clocks out” when leaving the building, others in the office will see that they are out because the button on their phone corresponding to that person’s extension will wink amber. Also, the system can be programmed so that you can optionally have several things happen automatically when you leave the building: your personal greeting can be switched to your out-of-office greeting, your phone can be call forwarded to an outside number (such as a cell phone), and/or your phone placed in Do Not Disturb. When you re-enter the building, your phone settings change back automatically. I am sorry, but we do not have the resources to translate the blog into Italian or any other language. We are glad that you are enjoying the blog. Anyone can use the Google Translation tools to translate any page. Here is this one in Italian. We use Google on our web site for German, French, Italian and Spanish. Hey, that’s pretty cool. Thanks for the info and link.